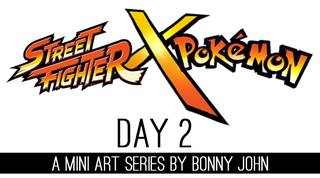 SF x PKMN Day 2! Ken x __________ ! When Gouken issued the challenge for Ryu and Ken to adopt a Pokemon disciple, the two fighters and their competitive spirits kicked into high gear. It took quite some time for Ryu to build a relationship with Riolu before he could call him his partner, and it was his understanding that Ken, born into wealth, had purchased his Pokemon rather unemphatically. It would be quite some time before Ryu actually learned the truth of how Ken and Blaziken would come to meet and how coin was involved. Ken could barely contain his excitement to search for a Pokemon partner when Gouken called for the next level of their training. He set out into a nearby village to purchase Pokeballs for the occasion. He soon made acquaintance with a traveling merchant who stopped at the village to peddle a variety of wares, including Pokemon. They creatures on his creaky old cart looked withered and defeated, all caged in poor condition...All but for one Torchic, who was jumping around in it's tiny confinement. It looked like it was trying to escape but barely had any energy to even spew the tiniest of embers. Ken thought to say something, but wondered if it was his place to do so. He wrapped his hands around the metal bars, looking at the creatures whose heads hung low and then caught the eye of the Torchic. "I'll buy the whole lot of these," said Ken adamantly. The merchant looked at the American and complimented his Japanese before challenging his wallet. "I doubt you could afford them, foreigner"
Ken emptied a sack of an impressive amount of coin into his one palm. The whole conversation turned into a scene where a few of the townsfolk began to watch in anxiousness. The merchant's eyes lit up counting the coins and mumbling to himself, adding up the sum in his head. "Hmm...There's a lot here...But I'm sure I'd fetch a lot more than this so either you can double it or piss off,"
The merchant swatted away Ken's hand, scattering the money all over the road. Ken began heating up, with literal flames beginning to produce around his fist. "What'll happen to these creatures?" asked Ken with a somber tone. "That's up to the man with the most coin," replied the merchant with a creepy grin. I know a few of these creatures might make good workers and a fine din-"
A light began to shine from one of the cages – one of the Pokemon began to evolve in sight of Ken's intentions to save them. Bursting out of the cages quite literally was a newly evolved Combusken. The merchant fell over, holding onto the cart before losing grip and tumbling to the ground. In this motion, the cart tipped over, sending the crates of wood crashing to the floor. Combusken freed the others while Ken looked over the merchant, trapping him underneath his dirty foot. "Don't look now, but there goes all your stock,"
Combusken now stood over the merchant, readying up flames in it's mouth. "Hey hey," warned Ken. "That's not how we do things here. Come with me, and I'll train you to be as strong as me one day." A large toothy smile took up Ken's face as Combusken gave a nod that began the birth of their unbreakable bond. And that was how Ken "paid" for his partner. Blaziken and Ken both love to showboat. Just like how Ryu's personality and attitude influenced Lucario, Ken created a near clone of himself in his partner. Blaziken has grown up to admire Ken's brash and aggressive fighting style, and incorporates a lot of flair into his technique. Similarly, Ken learned to channel ki and turn it into flame watching Blaziken, adding it to his now iconic fierce Shoryuken. Because the two are nearly the same height, they are able to lightly spar, unlike Ryu and Lucario. Blaziken's greatest fear is disappointing Ken. On paper, Blaziken has the upper hand against Lucario every time. As far as type match up, Blaziken should win every battle between him and his rival. However, this is not the case. The first mistake Blaziken made was to hold back from his fire based martial arts skilled. This greatly upset Lucario who declared such a handicap was an insult. Lucario has learned to withstand the fire based specials and combats it with his own aura techniques as a buffer. Lucario considers himself to be the better fighter, but greatly respects Blaziken and Ken. Blaziken of course thinks otherwise and will always go out, type advantage and all in anticipation of a great battle. The two are great friends but because of their night and day personalities, Lucario enjoys to train mostly on his own. Part of Lucario would love to learn how to get flashy while the same goes for Blaziken who wishes he had the same level of diligence towards training as Lucario. Like the pairing of Ryu x Lucario, I think I nailed this set up. Ken is known to have more specials regarding kicks including the Shippu Jinraikyaku and Guren Senpukyaku to name a few. Aside from his flame oriented hurricane kicks, Ken is known for his fierce Shoryuken, the high rising uppercut that hits with flames. All of that led me to connect him to fire types, never mind the fact that he's known for his red aesthetic. As a fire type fighting Pokemon who is known for blaze kick, the connection was made right away. I imagined the two as fiery and dazzling in the combos they'd produce, as a team and otherwise. Blaziken, depicted here is drawn to scale as he's an impressive 6' 3" tall fighter and therefore looks lankier than usual. I gave him a muay thai/tae kwon do dual fighting style that I referred to from Sagat and Juri respectively. Little did I know the official Mega Evolution art features a similar pose that I only found after I depicted Blaziken. So yeah, there you have it! I think I covered all that I needed today. The two sets of brothers in friendly rivalry are ready to spar. Here's the assets and the fighters put together. This is the only duo of the mini series with a set with images that lock together. The background being white was too plain after I set everything up so I looked for an artsy fartsy way to add some spice, and I used Google to pull up a nice scenic background that was fitting and edited it to look a bit pixely like a video game background. So to make it clear, I did not paint the background. And that about it does it for today! Thanks for tuning into day 2! What do you think about the artwork? Who do you think will win? No bias via type match ups, OK? !